The 2007 Mulungwishi Ministry Calendar asks for prayers for the Women's School, Mama Lorene, Mama Kat, the teachers, staff, and students. 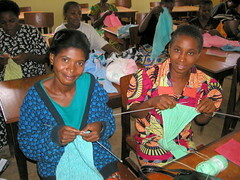 The women's school provides education and training for the wives of seminary students and others from the surrounding area. It prepares them to be women of God.